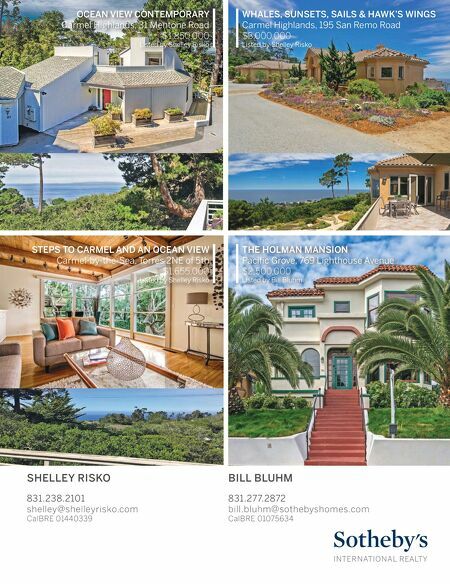 R YA N M E LC H E R P R O P E R T I E S RYAN MELCHER, REALTOR ® Oceanfront and Estates Specialist 831.521.5024 RyanMelcher.com | Ryan@RyanMelcher.com CalBRE 01897036 R|M CARMEL 5459 Quail Meadows Drive $3,195,000 A stand-alone estate behind the gates of the highly sought after Quail Meadows. Sitting up and above the road on a sun-drenched piece of heaven, this meticulously maintained home offers clear views of the mountains, private outdoor living and mature, twisted oaks adding immeasurable character to the landscape. A newly constructed, detached guesthouse with every amenity and it's own separate driveway make this a property not to miss. 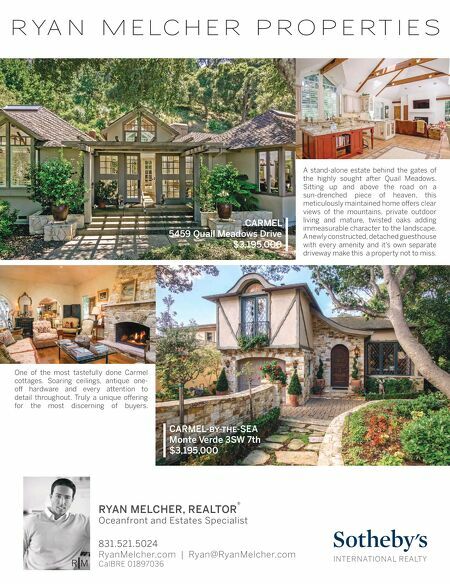 CARMEL-by-the-SEA Monte Verde 3SW 7th $3,195,000 One of the most tastefully done Carmel cottages. Soaring ceilings, antique one- off hardware and every attention to detail throughout. Truly a unique offering for the most discerning of buyers.